The UK LP has its own variation of the artwork which is different to that of the cd and, of course, the cassette (view front and back from menu on the left). The sleeve is gatefold and opens on a black and white image of fans fighting for a piece of Morrissey's shirt (view left). 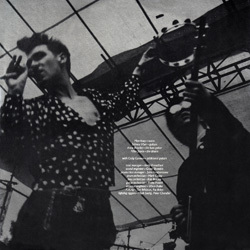 The thick inner sleeve shows on both sides a live shot of Morrissey and Johnny, in silver and black, with credits added in white in the middle (view left). The labels are yellow with black text in a layout that is, for the first time, not quite the classic Rough Trade one. A limited run of the LP included a copy of the 12"x24" promo poster mentioned below. 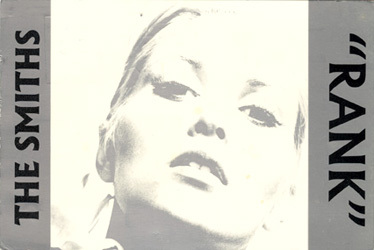 The packaging is identical to that of the basic UK LP, but a round silver sticker on the front advertises that the item "INCLUDES POSTER" and gives the catalogue number ROUGH126L. The front of the cassette insert shows the cd variation of the artwork at the top, and the track listing below in white over brown. The spine and back are also brown with white text. The track listing is repeated on the back on both sides of a barcode. The insert unfolds twice. Each panel repeats the pattern from the front, but the Alexandra Bastedo artwork is given a greyish brown tint on the first panel, and a reddish brown tint on the second. The album's credits are printed in the brown bottom portion of each panel. In most cases the reverse of the insert is all brown with no text while in later reissues it is just plain white. There are two variations of the cassette itself. Both have brown labels with white text except for "The Smiths" which is printed in black. The most common variation is made of brown plastic while a less common one, perhaps a cheaper repressing, is made of black plastic. If it wasn't lost or replaced, the back of the plastic case is brown instead of black. It is speculated that the black plastic + grey labels cassette in a UK insert may be a Swedish edition. See Swedish cassette below. 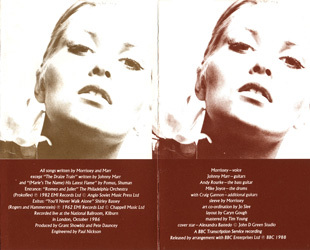 The UK compact disc has its own variation of the artwork which is different to that of the LP and, of course, the cassette (view front and back from menu on the left). The outer page of the booklet is thick and rigid. It opens on repeats of the Alexandra Bastedo artwork in different tints. The photo of fighting fans from the gatefold sleeve of the LP is found in the middle of it, followed by two pages of credits. The back of the booket only shows a closeup of the flower from the front artwork. The cd surface is white with a silver stripe across the middle, a pattern also used on the Smiths singles re-released on compact disc by Rough Trade at the time. The catalogue number, "The Smiths" and "Rank" appear above the stripe, and the track listing below, all in brown. This is the only time any title by the Smiths or Morrissey was ever released on DAT format, so there's no need to say how much this is sought after by collectors despite the fact that most of them can't even play DATs. The front shows a cropped variation on the usual artwork. The back is brown and features the track listing in white at the top, and credits below in black. The spines are also brown with "The Smiths" in white and the rest ("Rank", logos) in black. The insert unfolds twice. The first panel is all brown with credits at the top in white and more credits at the bottom in black. The second panel is a repeat of the Alexandra Bastedo artwork, but it is tinted brown instead of grey. The Rough Trade address is printed at the bottom. The DAT tape is made of black plastic with release information printed on it in white. A4 size 80-page book featuring the music and words for the tracks on the album. Also includes black-and-white photos of the band and a poster (view here). The main means of promotion of this album was through white label copies of the LP. Some copies were distributed in a stock sleeve, others in a plain white paper record bag. Some copies came with this promo postcard. Other copies sent to retail came with the promo kit described below. Some copies of the album were distributed for promotion with an A4-sized press release with blue/purple "Rough Trade Records" header. It appears that these were stock copies, but they may have been white labels. A few collectors have managed to get their hands on what appears to be a very early promo set. The record features white labels marked only by 'A' and 'B' in big silver letters. It is slipped in a plain white paper record bag. The set includes a copy of the 12"x24" promo poster described below as well as printer's proofs of the outer sleeve, the gatefold image and the inner sleeve, as described below. The latter item is unfolded, so both sides are seen bottom to bottom. The credits on one side list Craig Gannon among the classic Smiths line-up, so on one collector's copy the personnel credits are circled in black marker and a printed note with the corrected text (the line "with Craig Gannon - additional guitars" printed separately from the four Smiths) is stapled to it. A variation on this item has no silver 'A' and 'B' on the label, no poster and no correction related to the involvement of Craig Gannon. 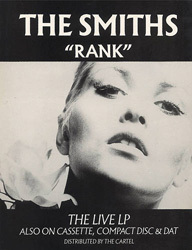 Some promo LPs were sent to retail with this promo kit consisting of a counter stand, a copy of the 12" x 24" poster described below, a promo postcard and a reversed window-clinging sticker stating "Just as you thought it was safe to buy the bootleg / The Smiths "Rank" / The live LP � out next week". Many sets in circulation nowadays have become incomplete. They often include only the postcard and/or the sticker as the other items were used then thrown away, destroyed, or given to someone else. The release of "Rank" was also promoted with the inclusion of a flexi in the September 1988 issue of industry magazine "The Catalogue". The flexi features on one side a live version of "London" lifted from "Rank", and on the other side a Morrissey poem titled "Poppycocteau", in Morrissey's handwriting. Subway size promo poster (view here). Medium size promo poster, may not be official (view here; better photo needed). This item showing the LP artwork on cardboard, was very likely used for retail promotion. Promo-only rigid card counter stand featuring sleeve artwork, release information and 'live' picture insert with stand (view here). 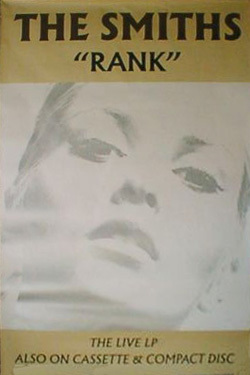 This 3-foot high/large square promotional silkscreen print showing the "Rank" artwork was originally used for major record shop window promotion. The canvas is mounted on a wooden frame and shows just the image, not the band name nor album title. This full page advert for the HMV record chain is based around the release of "Rank". Most of the top half shows the album's artwork (without the band name and album title on it). "The Smiths" appears above it, and "Rank" beneath, followed by the line "Your last chance to catch the Smiths playing live - at HMV" and the HMV logo (image needed). Black and white advert. View here. CD-r to promote 'The Smiths - Complete - Remastered by Johnny Marr' reissues. Comes in a PVC sleeve with full color artwork and fold out insert. Additional information needed. Two different test pressings have been reported. This item is doubly appealing to collectors because it comes in a sleeve without the Alexandra Bastedo artwork and album title on the front, only the band name in brown, in the same font and position as on the final artwork. The record inside bears all white labels and is slipped inside a white paper inner sleeve. Some copies of this alternate sleeve are circulated with the regular record and inner sleeve inside. This test pressing comes in a plain black die-cut thin card sleeve. The record features generic Mayking labels. The a-side label was stamped with the date '8 AOUT 1988' in blue ink. The catalogue number ROUGH 126 is handwritten on it in blue ink. The b-side label is also a Mayking one but it was not filled in with any information. A printer's proof showing the LP's outer sleeve artwork has made it into the hands of collectors. It shows the front and back artwork side by side, with the spine in between, with cutting marks around. There doesn't seem to be any differences between it and the definitive artwork. Printer's proof showing the LP's gatefold image, unfolded, with cutting marks. Printer's proof showing the LP's inner sleeve unfolded, so both sides are seen bottom to bottom, with cutting marks around. The personnel credits on one side list Craig Gannon among the four Smiths instead of separately. The BBC's reel to reel tapes which were used in the planning of this live album have made it to the collecting market. The set includes three reels. Each one comes in a green BBC TS box (TS = Transcription Service). The set comes with 3 sheets of paper. Two of these have the track listings of side 1 and side 2, in Morrissey's handwriting. The other one has a typewritten setlist from the BBC'S In Concert, with handwritten sidenotes (not by Morrissey). 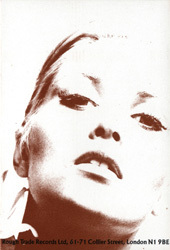 Also included in the set is a handwritten note by Morrissey stating that the cover star will be Alexandra Bastedo. This 2012 issue on standard jewelcase features the usual cd artwork on the front. The back shows a barcode top centre, above the catalogue number in brown and the logos for the two labels, also in brown. The album title appears in brown in the top right corner, above the track listing in black. Credits are printed in brown at the bottom. Information about the booklet, disc and spine is needed. The initial CBS LP sleeve is gatefold and features the usual LP artwork on the front, but it is thinner and not as robust as in the UK. It usually has a big white sticker on the front advertising the album's content in red. The back has the expected variations in catalogue number and label credits. The inner sleeve is identical to the UK one in colour and thickness, but the catalogue number in the corner was corrected. The labels are the classic green and red CBS ones. The Festival LP sleeve is gatefold and as thick as the British sleeve. The front shows the usual LP artwork and the back differs to the UK back in the catalogue number, the absence of any barcode and the presence of additional Festival credits and logo at the very bottom. The record features the usual generic Festival labels, red with black text and round Rough Trade logo at the top. It is slipped inside a thick, clear inner sleeve with round bottom which is in turn slipped inside the usual silver picture inner sleeve. This Festival inner sleeve is a bit thinner than its British counterpart, but it has a nice glossy finish. 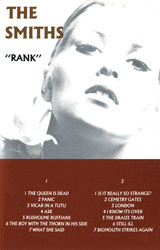 The original CBS cassette shows the LP artwork on the front, above a brown background with white track listing. The back of the insert is full and also features the track listing in white over brown. The insert content is basically the same as in the UK. It opens on repeated Alexandra Bastedo photos in different tints, above credits. The track listing is also printed on the reverse of the insert, in black and white. The cassette is made of dark transparent plastic with track listing and credits printed in white directly onto it. Festival did not stick to the usual cassette artwork for its cassette reissue. It features on the front the usual LP artwork over a black background (view in left menu). The back and spine are also black with white text. The back space is mostly used for the track listing, a Festival logo, Dolby information and trademark credit. The name of the band appears above the album title, both in a plain font, on the left of the spine, with Dolby and Rough Trade logos and the catalogue number on the right. The insert has one extra inner panel on which is printed in black over white the track listing and various credits. The remaining credits are found on the reverse of this extra panel. The cassette itself is made of off-white plastic with black text printed directly on it: album id and track listing at the top, Dolby and Rough Trade logos on the left, side number and catalogue number on the right, copyright at the bottom. The front of the original CBS compact disc shows a close variation on the usual cd artwork in which the text is just slightly smaller than elsewhere. The back is completely different. 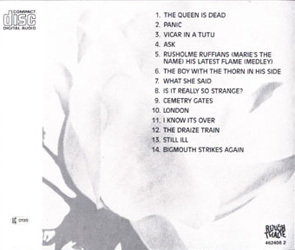 It shows a closeup of the flower from the front artwork (just like the back of the UK cd booklet), with track listing printed over it in a plain black font. There's a white stripe at the left with only the compact disc logo at the top and the label code near the bottom. The booklet is just like the UK one but the outer page is not thicker than the inner pages. The back of it repeats the close-up of the flower with track listing. The cd surface is plain silver with black text printed directly onto it. The track listing and credits are printed above and below the center, a circle Rough Trade logo appears to the left and catalogue number and more logos to the right. For once the Festival compact disc was treated with a minimum of attention to design. The front shows the same slight variation on the cd artwork used on the front of the CBS compact disc. The back was also based on the original CBS back, but there is no white stripe at the left, the Festival catalogue number was added in the top right corner, Festival credits were added in the bottom left corner, Festival and Rough Trade logos appear at the bottom centre, and a compact disc logo in the bottom right corner. The booklet is identical to the CBS one, which is a huge improvement on the usual folded insert found in Festival compact discs. The cd surface is also silver with black text, but the layout is completely different. The packaging and content of the 1993 cd reissue on WEA parallels its European counterpart described below. The only difference is found in the licensing credits on the disc (confirmation/detailed information needed). A later variation with black disc surface may exist (confirmation needed). Stock copies were made into promos by being stamped in gold on the back of the sleeve with the promo warning "Promotion only not for sale". A cassette presumed to have served very limited in-house reference purposes at the time of the Festival reissues has made it into the hands of at least one collector. Its packaging is very basic, not much more elabore than a homemade mixtape. The cassette is made of white plastic and has the words "Property Of Festival Records" and "Definitely Not For Sale" as well as the side number printed in a big plain black font directly onto it. The insert is made of plain white paper and has the track listing typewritten on its front and "The Smiths - Rank (Live Recording)" typewritten on its spine. Nowhere on the cassette or insert is there a label logo, catalogue number or credit. The fact that around 1988 Megadisc were in the midst of administrative problems may be the reason why the "Rank" compact disc was released jointly with the German branch of Rough Trade. The packaging is very much like that of the UK cd. The front shows the usual cd artwork. The Rough Trade catalogue number on the back was dropped but, surprisingly, the Rough Trade UK address remained. The barcode at the top was replaced with Megadisc/Rough Trade Gmbh credits. The booklet differs from its British counterpart by only minor details. The only notable difference is the cd surface which has its own unique layout of brown text over silver. Catalogue number, band name and album title appear at the top, logos in the middle and track listing at the bottom. The Brazilian LP shows the usual LP artwork on the front. The back is based on the UK back, but the catalogue number was moved from the top right to the bottom left corner where is also found a Stiletto logo and Stiletto credits in place of the barcode. The album title in the top right corner appears in a very pale beige tint. The sleeve is gatefold and the record can be slipped inside either panel. Some copies have been seen with a plain white paper inner bag, others with a very thin and wrinkly anti-static inner sleeve (one of these is the true original inner sleeve, the other likely not, but which?). The labels are white with black text and a Stiletto logo at the top. The Brazilian cassette features a reproduction of the LP artwork on the front over a black background. "The Smiths" and "Rank" appear in white above it, and Stiletto and Dolby logos below. Information about the back, the insert content and the cassette itself is needed. Promo copies of the LP are stock ones stamped in gold with the promo warning "amostra invendavel" on the back. The stamp is round and features a BMG logo in the centre. 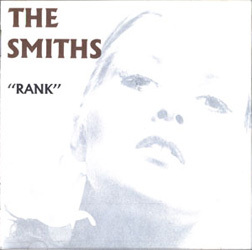 "Rank" was pressed in very limited quantities in Canada and copies are difficult to find nowadays, on any format. LPs and cassettes are obviously not sold anymore, but they are rarely found used. For many years the Canadian cd was out of print and American copies were officially imported to meet the demand. The Canadian LP shows the usual LP artwork on the front. The back is based on the UK back but it differs from it in the the catalogue number and credits. The sleeve is gatefold. The picture inner sleeve looks like the British one but it is made of grey paper instead of silver card. For once, instead of going for the classic yellow Sire labels, Sire Canada replicated the better looking yellow labels from the original UK artwork, with the expected corrections in catalogue number and credits. The insert of the Canadian cassette is very similar to its British counterpart. The differences are very minor ones: corrected catalogue number and barcode, positioning of the track listing on the front moved a bit higher, "Rank" on the front appears in brown instead of black, Sire logo added to the spine and Sire credits replace the Rough Trade address on the back. The reverse of the insert shows the black and white images of fans fighting for Morrissey's shirt over the three main panels, with Sire logo, catalogue number and credits printed in white over black on the reverse of the spine and back flap. The cassette itself is made of black plastic and the text is printed in light grey directly onto it (titles top, logos left, credits bottom, side number and Dolby logo right). This record club edition differs from the standard one described above by a few minor details here and there. There are no differences to be found on the front or on the two inner panels. The catalogue number on the spine was replaced by its Columbia House counterpart, above the order number between parentheses, and "CRC" was added next to the Sire logo. The credits on the back flap were replaced by Columbia House ones. Similarly, the catalogue number on the cassette itself was replaced with the Columbia House one, with "CRC" added beneath that, and the credits at the bottom were also adapted. Finally, the Columbia House catalogue number was added in the bottom right corner of the reverse of the insert. There are two known variations of the Canadian "Rank" cd. Both feature the usual cd artwork on the front, including the words "A Digital Recording" in the bottom left corner, just like in the USA. In both cases the back is just like the back of the USA cd with slightly different credits. A Sire logo and Sire credits are found at the bottom and a barcode at the top inside a white box. However, in the second edition the credits at the bottom are a bit longer and end with a small Warner logo. The booklet for the earlier edition features the same content as the British booklet, but it unfolds instead of being made of pages stapled together, and the two pages with credits are in black and white. For later reissues, the booklet is stapled and features the same content in a different order. It opens on a brown variation of the cover star next to the first page of credits, under "SMITHS" and in brown instead of black and white. This is followed by the usual black and white image of fighting fans. Closing the booklet is another brown image of the cover star, next to the second page of credits, the one under the header "RANK". The back of the booklet shows the usual close-up with a Sire logo in the bottom left corner next to a short line of text and the Canadian catalogue number, all in a shade of brown that is more golden than elsewhere. The cd surface for both variations was modeled on its British counterpart, which means that it has a white surface with brown text and an unpainted silver stripe across the middle. The Sire logo is found on the left side instead of the compact disc logo. However both versions may vary in text font and perhaps credits content (confirmation needed). Between the two editions described above, an hybrid edition of the Canadian and American editions could be found in record shops. This edition combined the Canadian disc with the American packaging. The credits on the disc were of Sire and WEA Canada while those on the back tray inlay were of Sire USA. Promotion of this album in Canada was done via stock copies of the LP stamped in gold ink on the sleeve. While the stamp is found on the front of the sleeve in the USA, it is always on the back for Canadian releases. The Canadian promo stamp also has the particularity of being bilingual, the promo warning appears in both English and French, the country's two official languages. After purchasing the rights to the Smiths catalogue in 1992, Warner released two best ofs then in 1993 proceeded with the reissue of all the albums over the territories they controlled. Their 'international' edition was "made by WEA in Germany manufacturing Europe" as the credits state and was sold mostly in Europe and in some Latin American countries. The design of the various formats was based partly on the original British and American designs. The WEA cds and cassettes were reissued again in 1995 when the "Singles" compilation came out, but these repressings are identical to the 1993 editions, except for a yellow exclamation mark sticker on the front of the case marking them as half-price reissues. The packaging of the 1993 cd reissue is based on the original Rough Trade UK edition. The front is identical, and the back is similar: the barcode was placed in a white box and the compact disc logo and Rough Trade catalogue number and address were replaced with WEA logo, catalogue number and credits. Information on the booklet and how it differs to the original Rough Trade booklet is needed. The cd surface is silver with text printed directly onto it in black and white. The band name, album title and track listing appear at the top in black, and logos, catalogue number and credits are found in the middle and bottom in white. The front of the plastic case, if it hasn't been replaced, has a small Warner logo etched into the plastic in the bottom right corner. Note: The French price code on the back is "WE835". The existence of copies for which this appears as "France WE833" is suspected. The cassette artwork was completely redesigned by WEA. The new design was closer in style to the LP and compact disc artwork (view left). Information about the back, the insert and the cassette itself is needed. WEA had something specifically for collectors in their 1993 reissue programme as every album was also put out on limited edition numbered 10" sized LPs. The records were produced in very thick vinyl. In this particular case the content was spread over two records because there was too much material for just one. Their labels are black with silver text. The inner sleeves are plain white paper ones, which means that the image featured on the original inner sleeve is unfortunately missing. The sleeve is not gatefold which means that the image of fans fighting for a piece of Morrissey's shirt is also missing from the packaging. The front of the sleeve shows the usual LP artwork. A white box in the bottom left corner has the run number stamped into it. The back is more or less the same but there is much more text on it because the credits usually found on the inner sleeve were reproduced above the barcode. The Rough Trade catalogue number and label code were dropped and WEA logo, catalogue number and credits were added at the bottom, with the barcode. The French LP shows the usual LP artwork on the front. The back is based on the UK back, but it differs in the catalogue number and presence of Virgin credits. The sleeve is gatefold. The inner sleeve is just like in the UK except for the different catalogue number in the top right corner on one side. The labels are very similar to their British counterparts. The main differences are the catalogue number, the presence of a SACEM logo at the bottom and the credits around the edges. At first glance the insert of the French cassette looks very much like the British cassette insert but there are quite a few subtle differences. 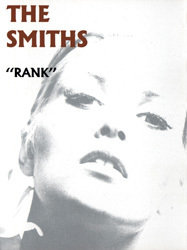 The most interesting is how the colour pattern of the text over the front image was reversed: "The Smiths" is printed in black and "Rank" in brown instead of the other way around. As expected, the catalogue number on the spine was changed for the French one. The Rough Trade address on the back was changed for a Virgin credit. It appears that the '1' in the track listing on the front is missing, although this may not be the case on all copies. The cassette is beige with blue text printed directly onto it. Most French compact discs were made in France by MPO but this one was unexpectedly pressed in Austria for the French market by DADC. The packaging is very much like that of the British edition it was based on. The front shows the usual cd variation of the artwork. On the back the Rough Trade UK catalogue number and address were replaced with a Virgin credit, and the Virgin catalogue number was added under the barcode. The booklet appears to be identical to the British booklet (confirmation needed). On its back the Rough Trade catalogue number was changed to the Virgin one. The cd surface follows the same design, but the text is printed over the white portions in black instead of brown and a few expected changes were made to account for the involvement of Virgin. Test pressings of the French LP have been spotted on the collectors market. These, like any other French test presssing, are very rare. They have white "Echantillon" labels with dotted lines to be filled in with release-related information. They come in a plain white record bag. The German LP shows the usual LP artwork on the front. Information about the back and the inner sleeve is needed. The labels are identical to the British ones except for the credits found left and right of the center which were printed in a different font, mention a different catalogue number and include a GEMA logo. See Benelux/Germany cd descrition above. The Greek LP shows the usual LP artwork on the front. The back is very similar to the back of the UK LP. The catalogue number in the top right corner was changed for the Greek one and Virgin/EMI Greece credits were added in the bottom left corner. This edition is the only one produced with a single (non-gatefold) sleeve with the exception of an American record club edition. The usual gatefold image of fans fighting for a piece of Morrissey's shirt was reproduced on a folded 12"x24" insert found inside. The record is slipped inside a clear anti-static sleeve of good quality so the usual silver Morrissey+Marr inner sleeve artwork was moved to the back of the latter "fighting fans" poster-insert, both sides of the inner sleeve artwork bottom to bottom on the same side of the poster. The labels are white with black text and "The Smiths" at the top in brown, but the text layout is identical to that of the yellow British labels. The catalogue number on them was changed for the Greek one and Greek credits were added around the edge. The front of the Greek cassette looks just like the front of its UK counterpart, but the bottom part featuring the track listing is black instead of brown. The spine and back are also black with white text. The spine is similar in content to its UK counterpart, but the Chrome logo was replaced with a Dolby one and, as expected, the catalogue number was changed. The back is also similar to the UK cassette insert back, but lacks the barcode and adds a Dolby logo. Information on the rest of the packaging (insert, cassette) is needed. Copies that are still sealed have a pale blue sticker around it which probably has something to do with marking this as an official, non-bootleg release. Stock copies were made into promos by having the labels stamped with the promo warning "ΔEIΓMA ΔΩPEAN". The Dutch LP shows the usual LP artwork on the front. Information about the back and the inner sleeve is needed. The labels are identical to the British ones except for the Rough Trade logo and catalogue number which were replaced with Megadisc logo and catalogue number as well as a STEMRA logo. This item is quite nicely packaged for an unlicensed release. 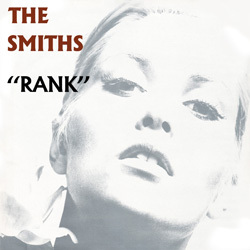 The front artwork shows a close-up of Alexandra Bastedo's face, with "The Smiths" and "Rank" appearing in the top right corner in the same font and colour as on the usual artwork. A CBS logo appears in the top left corner and the line "The sale of this cassette outside Indonesia is not authorized" appears at the bottom in both Indonesian and English. The back of the insert is full with two holes for the snap-shut case's plastic prongs to go through. It features the track listing and credits printed in white over black. The wrap-around insert unfolds many times for more release information, what appears to be a bio, and the image of fans fighting for a piece of Morrissey's shirt that is usually found inside gatefold LPs. The cassette itself is charcoal grey with white text printed directly onto it. It looks like blank cassettes sold for home usage. The album features two bonus songs lifted from the band's selt-titled debut album. This is almost like the above edition. The only noticeable differences are the absence of the CBS logo on the front and the lack of a red logo on the spine. This cassette appears at first glance to be from the UK but it is assumed to be from Ireland because a good number of copies in circulation come from the latter country. The insert is perfectly identical to the UK insert except for the fact that its reverse is all white instead of brown. However the cassette itself is completely different. It is made of black plastic and its labels are grey with black text in a unique layout. 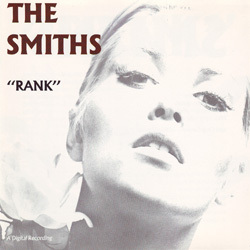 "The Smiths" is printed in the font used for the "Strangeways Here We Come" album, and "Rank" in a font never used on any other Smiths release. There is no track listing on them but the line "See inlay card for details" tells us where it can be found. A look at the matrix numbers tells us that the Israel LP was made in England. The sleeve and inner sleeve are identical to the UK ones to the smallest detail, which may explain why most, if not all copies have a black sticker on the front with two words in Hebrew. The only differences with the UK pressing are found on the labels, and then again they are subtle. The label code to the right of them was replaced with royalties credit ACUM/BIEM, the catalogue number was changed for the very similar Israel one and the credit around the edge was replaced with a different one mentioning Israel and including words in Hebrew. The insert of the Israel cassette looks at first glance very much like its British counterpart but when the two are put side by side subtle differences are noticeable. Firstly, the text on the image portion on the front is slightly bigger. The chrome logo on the spine and the barcode on the back were dropped. The Rough Trade address on the back was replaced with a distributor credit in English and Hebrew. Extra insert information (about the panels if any) is needed. The cassette itself is light grey, almost white, with text printed directly onto it in blue. Promo copies are stock ones with a promo sticker on the back of the sleeve. The sticker has a promo warning in Hebrew and English. The packaging of the Italian LP is very similar in appearance and quality to its British counterpart. The sleeve is gatefold and its front shows the usual LP artwork. The catalogue number and label code were dropped from the back, and a Rough Trade logo and the Italian catalogue number were added below the track listing. The barcode at the bottom was replaced with a CGD pictogram encouraging people to buy legal releases and the Cartel credit under the Rough Trade address was replaced with a CGD credit and address. Collectors interested in colour variations will have noticed that "RANK" in the top right corner appears in mustard yellow instead of the usual caramel brown shade. The inner sleeve is made of paper but it still has a nice glossy finish to it. The image on each side of it appears in light shades of grey instead of the usual silver and black. The labels look like the British ones but a few corrections were made in the catalogue number and in the credits around the edge, and the label code was replaced with copyright control credit SIAE/DR. This extremely rare Italian LP edition could be a budget reissue. It is also gatefold and appears to differ from the above edition by only a few details. Every occurrence of the catalogue number on the sleeve and labels was changed to the new one. The credits at the bottom of the back of the sleeve were slightly altered and the CGD logo usually found there was removed. Information about any other discrepancies is welcome. The front of the Italian cassette looks at first glance like that of most other cassette editions of "Rank", but the name of the band and album title on the picture portion are slightly bigger than anywhere else. The spine and back are brown with white text just like in the UK, but the catalogue number was changed for the Italian one and the barcode on the back was replaced with a CGD pictogram encouraging people to buy legal releases. Information about the rest of the insert and about the cassette itself is needed. This is one of four very rare Smiths compact discs to have been released in Italy, presumably all at about the same time. The packaging is very similar to that of the UK cd. The front artwork is identical. The main difference is the catalogue number printed on the rear, on the spine, and on the back of the booklet. The rest of the booklet looks identical to its UK counterpart but it may have been printed on thinner paper (to be confirmed). The disc is different. The text is simply printed in black over the basic silver surface. It features a Rough Trade 'circle' logo at the top, track listing to the right, and logos, catalogue number and credits on the left and bottom. This is final Smiths or Morrissey LP to ever come out of Japan, and because it was pressed in much fewer numbers, it is also the rarest. The sleeve is gatefold and its front shows the usual LP artwork. The back is very much like the back of the UK LP. The catalogue number in the top right corner was replaced with the Japanese one, and the barcode and Rough Trade address at the bottom were replaced with Victor Japan credits. "RANK" in the top right corner appears in mustard yellow instead of the usual caramel brown. The obi is white with brown and black text in Japanese. Its reverse advertises the complete Smiths catalogue on LP and compact disc, including the "Stop Me" mini-album. The record features the usual Victor labels with a mock-textured background and a circle Rough Trade logo at the top. It is slipped in a clear plastic round-bottom anti-static inner sleeve. The usual inner sleeve artwork was reproduced in the same silver and black on a 2-sided paper insert. Also found inside are two black and white paper inserts. One features a track listing and what appears to be a bio, and the other one has lyrics in English on one side and in Japanese on the other. This is one of only four cassettes ever released in Japan for the Smiths and it is a very beautiful item, even to those who don't usually collect this format. It was presumably produced in very small numbers and has become quite rare. The insert is of the type that wraps itself around the cassette, so it has two spines, one with text in English, the other in Japanese. The front shows the usual cassette artwork, but the text on the image part is slightly bigger than on the UK cassette. The back also shows an image of cover star Alexandra Bastedo, but in a brown tint. The brown bottom section is packed with credits, release information and a black and white barcode. The reverse of the insert features more or less the same content as the UK insert's two inner panels: repeats of the Bastedo artwork in different shades above credits in white over brown. The 'J' portion of it shows an ad for "The Smiths - The Complete Story" with a small picture of the cover of the book. The cassette itself is made of white plastic and its labels are brown with a layout and colour pattern copied from the labels of the UK cassette. The packaging contains a large white glossy insert with track listing, bio and lyrics in black. This insert has to be folded in nine to fit inside the case. 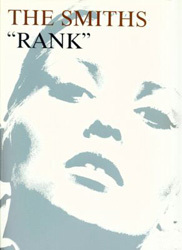 The original cd edition of "Rank" in Japan features the usual cd artwork on the front. Information about the back and booklet content is needed. The back of the booklet is just like the back of the British booklet but the catalogue number was changed for the Japanese one. The obi has a grey marble-like texture with black text. A box at the bottom of it states "digital remaster", which is of course untrue. The cd surface has the same silver horizontal stripe pattern than the British cd but the credits were changed for Japanese ones. It is the only Victor cd to not feature the standard Victor look and text layout. In 1990 Victor reissued the complete Smiths catalogue on compact disc only (the "Meet The Rock" budget series at 2000 yens). The packaging of this edition is very similar to that of the 1988 edition. The front and back as well as the cd surface are identical except for the corrected catalogue number. The booklet also appears to be the same (confirmation needed). The obi was changed to the blue and yellow theme of this "Meet The Rock" series. The cd tray is made of white plastic. This edition is not very common. This new Japanese edition was released by WEA who had just purchased the rights to the complete Smiths catalogue the year before. It was modelled on its European counterpart and the packaging is superior to that of the Victor releases. It shows the usual cd artwork on the front. Unlike its European counterpart, the Japanese cd has the barcode on the back of the obi instead of the back of the cd tray inlay. The obi is light blue-green and beige with a blue "Smiths Original Catalogue" crest common to all re-releases in the series. Its back covers the complete backspace and displays over a beige background "The Smiths Original Catalogue", an illustrated list of the eight albums being reissued by WEA. The disc is plain silver with track listing at the top in black and credits and logos in the middle and bottom in white. The cd tray is made of white plastic. Information about the booklet is needed. In parallel with the release of the "Singles" compilation, another reissue programme of the Smiths' back catalogue was put together by WEA in Japan. This 1995 budget reissue is very similar to the one from just 2 years prior. The most noticeable changes were the white obi with red ignited 'Hot price!' 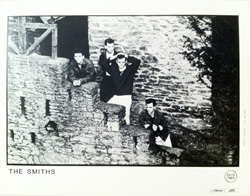 bomb common to all the releases in the series and an additional "Smiths Original Catalogue" insert inside. The cd tray is still made of white plastic. The most recent reissue programme of the complete Smiths catalogue in Japan dates back to 2006 when all the albums were re-released in mini-replicas of the original LP sleeves. These are slightly bigger than the typical size of a compact disc. 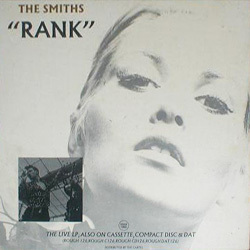 In the case of "Rank", the original limited edition UK LP pressing including poster served as a model for everything with the exception of the obi which was based on the original Victor LP obi. This means that the sleeve is gatefold, its front shows the LP artwork instead of the cd variation, and WEA went as far as adding a round silver "Includes poster" sticker on the front, just like the original limited edition UK LP. The back is very much like the original UK back but the catalogue number was changed and the barcode was moved to the back of the obi. The cd surface follows the same colour pattern and layout as the original UK LP labels, which means that it is orange-yellow with black text. The inner sleeve is a quasi-perfect replica of the original UK LP one, down to the shape of the cut-out portion at the top facilitating access to the record/cd inside. The cd is actually also slipped inside a plastic film inner sleeve (the round bottom variety), which is in turn slipped inside the picture inner sleeve. A white paper booklet featuring the lyrics in English and Japanese and what looks like a bio is also found inside. More interestingly, also included is a replica of the original limited UK LP edition's bonus poster. It is sized 10"x20", which is of course smaller than the original, and is folded 8-fold in order to fit the sleeve. The text on it was trimmed down to "The Live LP" and "Distributed by Warner Music Japan". This is a bootleg compact disc. The American edition of the cd was packaged with a black obi with Japanese text to make it look like a Japanese import. The obi is very minimal, it doesn't mention any record label. Promo copies on LP have a red 3-character promo sticker around the top right edge of the sleeve and the same promo characters printed inside a box on the label, under "Side A"/"Side B". A very limited number of stock copies paired with a press photo of the band served a more limited promotional purpose. The press photo is the classic 8"x10" black and white type, with Rough Trade, Victor and JVC logos. The photo, credited to Jo Novark, is a rarely seen one showing the band in the stairs of an old house/building made of stone (view). The original 1988 release was also promoted with the help of a very limited promo cassette. Its orange and white insert features on the front the track listing in English and Japanese (including song lengths), the planned release date, the catalogue numbers for all three formats and some Victor credits. 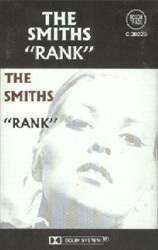 The cassette inside is all white with only a grey stripe at the top stating "The Smiths" and "Rank" in Japanese characters (for non-Japanese collectors: these are the same characters found on the front of the obis). Included inside is a white insert showing the album cover in black and white and the catalogue numbers for the three formats. The promo version of the original 1988 Victor cd has a red 3-character promo sticker over the barcode on the back and promo text printed in red around the cd's inner ring. Victor's 1990 reissue programme was promoted with copies of the albums (including this one) with "sample" stamped around the center of the cd and a promo sticker affixed to the obi. The Japanese promo cd is a stock copy with a white and red promo sticker on the back of the obi and promo text printed on the cd's inner ring. A promo counterpart to the 1995 cd edition is expected, but none has ever been reported for this title. Please write if you have any information. 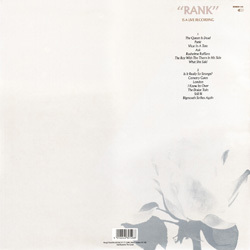 Promo versions of this edition of "Rank" are stock copies with an additional white sticker with red text over the barcode on the back of the obi and 'sample loaned' etched on the cd's inner ring. This cassette edition features the usual cassette artwork on the front, but the bottom part is black with the titles in white and a BASF logo is awkwardly positioned between the track listings of side 1 and 2. The spine and back flap are black and white variations of their counterparts on the UK cassette insert, with a few minor changes: the Chrome logo was removed from the spine and a Backbeat manufacturing credit was added on the back above the Rough Trade credit. The insert does not appear to have any extra panel (confirmation needed). The cassette is made of black plastic and its labels are quasi-replicas of the UK cassette labels, but they are of white paper with black text. Release identification and track listing appear on them at the top and the catalogue number on the left. The front of this item features the usual cd artwork over a white background. 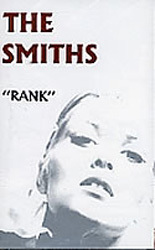 Above the image, "The Smiths" appears in blue and "Rank" in red. A red Music Matters logo is found beneath the image, between a Zaks/Biem copyright control credit and a Dolby logo. The spine shows the red Music Matters logo again, with "The Smiths" in blue and "Rank" in red. The back only shows a track listing in black over white. The track listing is repeated on the insert's first panel, with full credits. The right portion of this panel is a yellow Music Matters coupon that can be cut off by the owner. The cassette is made of transparent plastic with no text on it. A look at the matrix numbers tells us that the Portuguese LP was made in England. The sleeve and inner sleeve are identical to the UK ones to the smallest detail. The only differences with the UK pressing are found on the labels, and then again they are subtle: a Transmedia logo was added at the bottom and the credits around the edge were changed for Portuguese ones. The insert of this unlicensed item shows a very faded black and white version of the LP artwork on the front, under the band name in red and the album title in black, and above the Thomsun Original and Dolby logos. The words "Thomsun Original" are also printed in diagonal over the artwork. Information about the rest of the insert and the cassette itself is needed. There is no mention of the origin of this unlicensed edition anywhere on the packaging, but it has been reported as being from Saudi Arabia (confirmation/correction welcome). 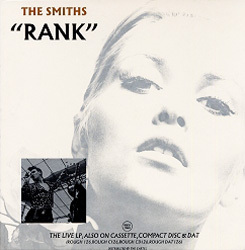 The front shows a close-up of the usual Alexandra Bastedo artwork, with the usual brown "The Smiths" in the top right corner and "Rank" in the bottom right corner, both in a font similar but still slightly different to the usual "Rank" font. The insert is a very minimalist affair, with a blank white inner side and nothing more than the track listing printed on the fold. The cassette itself is black with a small white sticker label at the top of each side, containing the words "Michael" and "Direct to Disc Master Sound", with the Michael and 7Rock logos on either side. The catalogue number is stamped above the latter logo in violet ink. A look at the matrix numbers and etching tells us that the Spanish LP was made in the UK. The sleeve is gatefold and its front shows the usual LP variation of the artwork. The back is just like the back of the British LP, but the catalogue number was corrected and the barcode was replaced with the Nuevos Medios logo and address in the same white box. The inner sleeve is not as thick and silver as in the UK, but it's still quite nice and glossy. The labels are light beige with brown text in the same layout as on the UK labels. The only changes made to the text are the following: the catalogue number was replaced with the Nuevos Medios logo and catalogue number, the credits around the edge were replaced with Spanish ones, and the label code was removed. The insert of the Spanish cassette is just like the British one, bar a few minor differences. "Rank" on the front appears in brown instead of black, just like in the USA and Canada. The label's logo and catalogue number replace the British catalogue number and the 'chrome' logo on the spine. The barcode on the back is replaced with Rough Trade and Nuevos Medios logos. The reverse of the insert is white instead of brown. The cassette is beige but it still bears the same brown labels as in the UK, with only a few expected corrections made to account for the involvement of Nuevos Medios. This item is quite rare, just like all other Spanish cassettes. To promote the release of this live album, stock copies of the LP were distributed with a pink A4 portfolio. The LP has a small white Nuevos Medios sticker on the back of the sleeve with the Nuevos Medios address in Madrid in black. The portfolio has a pink cover with "The Smiths" across the top of it in grey. It includes a 2-sided press release and 4 pages of lyrics in Spanish for the songs "London", "Still Ill", "Panic", "Bigmouth Strikes Again" and "Ask". The press release has 3 paragraphs of biographical information on one side, with a blue and red Nuevos Medios logo in the top right corner, and a Nuevos Medios discography of the Smiths on the reverse. This item can easily be mistaken for a British edition to the untrained eye. The sleeve is gatefold and the differences between it and its British counterpart are very minor. The front is identical and on the back the Cartel credit at the bottom, the label code and the barcode were removed. The inner sleeve is made of paper but it still silver, reasonably thick and very glossy. The labels are black and white versions of the British labels on which the label code was replaced with the copyright control credits (BIEM/n�b). This was the first and only Smiths compact disc ever released in Sweden. It is extremely rare and almost impossible to find nowadays, even in Sweden. The packaging is almost identical to that of the British cd edition on Rough Trade. The front and back are the same but there is no barcode on the back. The booklet is identical except for the outer page which is not thicker than the inner pages. On the other hand, the cd itself is completely different to any other "Rank" cd released elsewhere. Instead of the white and silver striped pattern, the surface is plain silver with text printed over it in black. "The Smiths" at the top is printed in the same font used on the "Strangeways Here We Come" album. Then "Rank" is printed in a completely unfamiliar font. A compact disc logo is found left of the middle, and copyright control credits (BIEM/n�b) to the right. The track listing is given in the bottom half. The front of this unlicensed edition of the album shows a variation of the usual Alexandra Bastedo artwork with slightly larger text, over a white background, under band name and title in an unrelated black script font, and above a black portion with Chinese or Taiwanese text. The insert wraps itself around the cassette, so one spine displays the information in English while the other displays it in Chinese or Taiwanese. Its back features the album's track listing next to a rotated detail of the flower from the usual back artwork. The cassette is made of black plastic and its labels are yellow with black text. The package includes a white paper insert featuring lyrics and early photo of Morrissey, folded many times so it can fit inside the case. 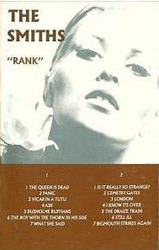 The front of this unlicensed edition shows a close-up of the usual Alexandra Bastedo artwork, with the usual brown "The Smiths" and black "Rank" bunched in the top left corner. "The Queen Is Dead � Panic" appears at the very bottom, next to a round, black '70' logo. Information about the insert is needed. The cassette looks like one that would be bought blank for home usage. Its labels are white with light blue, green and black graphics. 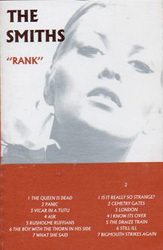 This other Thai cassette also shows a close-up of the usual Alexandra Bastedo artwork on its front, with the name of the band and album in the same font and colours, but "The Smiths" is at the top and "Rank" at the bottom. "The Smiths" on the spine is mauve, above the album title in black. The only other content on the spine is the catalogue number, printed in black at the bottom of it. The album's track listing is found on the back flap. The insert has one extra inner panel, featuring minimal credits printed in a mix of black and brown beneath the image of fans fighting for a piece of Morrissey's shirt. The cassette is made of black plastic and bears white and orange labels. The only information on the latter labels that relates to the release is the catalogue number stamped in the top right corner. The label name is in the top left corner. This third Thai cassette edition shows another variation of the usual album artwork on its front, with a cropped Angela Bastedo and the band name and album title moved to the top left corner. The spine is white and shows mainly the band name and album title in the same font as on the front, with label 'logo' and catalogue number at the bottom. The track listing is printed in black and white on the insert's back flap, above a few lines of credits and next to a small version of the usual LP inner sleeve photo of Morrissey singing live. The cassette looks like a commercial one as sold in retail. It is made of grey plastic and bears grey paper labels showing nothing on them related to the actual content except for a stamped catalogue number. The American LP shows the usual LP artwork on the front. The back is based on the UK back but it differs from it in the the catalogue number in the top right corner and credits at the very bottom. The sleeve is gatefold. The picture inner sleeve looks like the British one but it is made of grey paper instead of silver card. For once, instead of going for their classic yellow labels, Sire replicated the better looking yellow labels from the original UK artwork, with the expected corrections in catalogue number, logo and credits. The sleeve of this record club edition is not gatefold. It is expected to also differ from the standard retail edition in the catalogue number on the back of the sleeve, on the inner sleeve and on the labels. Any extra information is needed. The front of the insert of the American cassette is very similar to its British counterpart. The differences are very minor ones: corrected catalogue number and barcode, positioning of the track listing on the front moved a bit higher, "Rank" on the front appears in brown instead of black, Sire logo added to the spine and Sire credits replace the Rough Trade address on the back. What is unique is the reverse of this insert: the image of fans fighting for a piece of Morrissey's shirt is reproduced over the 3 mains panels, while Sire logo and credits are printed in white over grey on the two sections behind the spine and back. The cassette itself is made of clear plastic and the text is printed in light grey directly onto it. The packaging of this record club edition is basically the same as that of the standard retail edition. The only differences are minor ones. The catalogue number on the spine and on the reverse of the insert (grey side) was changed for the Columbia House one. The Sire credit on the back of the insert as well as on side B of the cassette was replaced with a Columbia House one. The American compact disc edition features the usual cd artwork on the front, with the words "A Digital Recording" in the bottom left corner (view left). 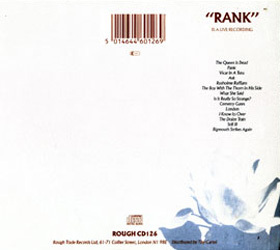 The back is based on the back of the UK cd, but the barcode at the top is inside a white box and the Rough Trade catalogue number and address at the bottom were replaced with Sire logo and credits. The booklet has the same content as the British booklet, but it unfolds instead of being made of pages stapled together and the two pages with credits appear in black and white. The cd surface was modeled on its British counterpart, which means that it has a white surface with brown text and a silver stripe across the middle. The Sire logo is found on the left instead of the compact disc logo. This record club edition is just like its standard retail counterpart, but the Sire catalogue number was replaced by the Columbia House one on the spine, at the top of the cd and on the back of the booklet, and extra Columbia House credits were added to the usual ones at the bottom of the cd tray inlay. This record club edition differs from the standard retail one by a few details here and there on the packaging. The barcode on the back was replaced in its white box with a BMG Direct credit and catalogue number. The latter number was also added in a plain black font in the top right corner on the back of the booklet. Finally a BMG Direct credit and catalogue number were added at the 2 o'clock position on the disc. Until about 1992-1993, compact discs were sold in the USA in tall picture boxes. Many were destroyed after purchase, but some were salvaged and ended up in fans collections. These featured their own variation on the album artwork. View front and back of the "Rank" longbox. The promo edition of the American LP is a stock one with a promo warning stamped in gold ink on the front of the sleeve. The album was more limitedly promoted with the help of an advance cassette. This item has generic "Tape duplication by WEA Manufacturing Inc." labels on which "The Smiths" and "WB-25786" was printed. The insert is a generic Warner Bros one with typewritten track listing, band name ("The Smiths") and catalogue number ("WB-25786"). Live versions of "Ask" and "Cemetry Gates" from this album were included on "Sire's Back To School Cassampler", a Sire various artists promo sampler sent to retail or perhaps media. The cassette has a black insert with handwritten white text (blackboard and chalk-style). The cassette itself is white with black text printed directly onto it. Other artists featured on the cassette are Ofra Haza, Ice-T, Tambu, A House, Ministry, Howie Klein. The album was also promoted with the inclusion of "What She Said" on the Warner various artists promo cd "WBR New Music Report". The front artwork shows the front covers of four albums being promoted (REM, Danielle Dax, Ofra Haza and A House, but no "Rank"), over a wine red background. A video was put together for the live version of "Ask" from this album, using live footage of the band on the Queen Is Dead tour. It was distributed to American media in a video case with insert dated '09/19/88'. 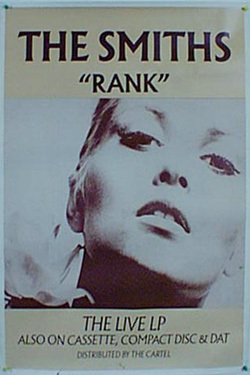 An official promo poster was produced by Sire for promotion of "Rank" in retail. The right portion of it shows the Alexandra Bastedo artwork. 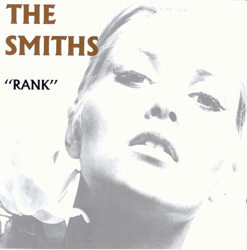 "The Smiths" appears in brown in the top left corner, above "Rank" in black and the album's track listing (photo needed). Promo flats were usually sent to retail for instore promotion at the time of release of an album. They are made of thick card and are the size of a LP. One side of the "Rank" flat shows an exact replica the usual LP format artwork. The other has no image, just "The Smiths" in tall brown letters, "Rank" in tall black letters, "The live album" under and a Sire logo+credits in small at the very bottom. Scan or good flat photo needed. A postcard advertising "Rank" has made it into the collecting world. It is not clear for what specific purpose it was produced. One side shows the LP's gatefold sleeve image of fans fighting for a piece of Morrissey's shirt, above the line "Fans Shredding Morrissey's Shirt, G-Mex Festival, Manchester, U.K. Fall, 1985." 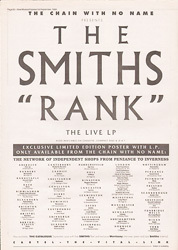 The other side shows no image, just "The Smiths" in brown, "Rank" in black, "The live album" in brown", and a small Sire logo+credit in the bottom right corner. Adverts are not often collected, but this full-page one has regularly been seen for sale probably because of its size, hence its mention in this collectors appendix. It was very likely cut out of industry magazine Billboard. 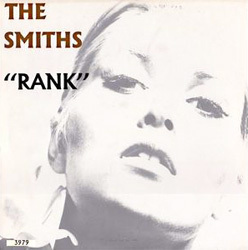 It shows the usual Alexandra Bastedo artwork with, in the top left corner, "The Smiths" in brown, then "Rank" in black above a few song titles and production credits. Sire logo and credits appear in small in the bottom right corner. Test pressings of this album have made it into the hands of a few lucky collectors. They are circulated in white die-cut sleeves with bright green "Advance Test Copy" sticker. The Specialty Records Corporation labels are off-white, they feature the company's logo at the top and printed lines below to be filled in with release information. In this particular case the handwritten information is the date ("8.4.88"), label ("Warner"), artist ("The Smiths"), matrix number ("ASR1") and catalogue number ("1.25786"). A "LP Label Copy" sheet with release information (track listing, credits) is included inside.